For sale by Public Auction on the 01 May 2019 at Double Tree by Hilton, Chesterfield Road South, Sheffield, S8 8BW. Situated in a superb backwater position in this highly sought after area is this stone cottage style terrace with two bedrooms and featuring a long garden. The house now requires refurbishment and modernisation but offers superb scope and warrants an early inspection. The house is vacant, has double glazing, gas mains connected with some electric heaters in situ, features cellars and also an attic room which may offer further extension potential subject to all the necessary consents and regulations. 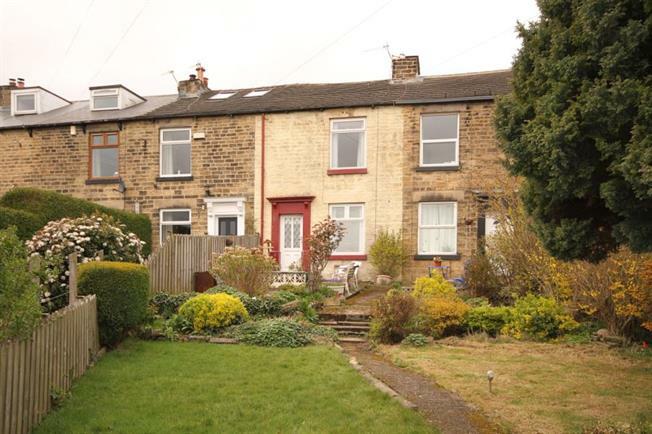 Location - The property is situated in a Crookes a popular suburb towards the south west of Sheffield. It ideally located for the full range of superb amenities including local shops and supermarkets, well regarded schooling and public transport links with access to the city. Close by are principal hospitals and Sheffield Universities, local pubs, restaurants and walks on the nearby BoleHills and Rivelin Valley. Ground Floor - Lounge with focal fireplace, inner lobby and dining kitchen with access to the cellar. First Floor - Two bedrooms and a bathroom/W.C. Loft ladder pulls down and leads to a good sized attic space into the eaves. Outside - To the front of the house and leading down to Cobden View Road is a long garden with lawn areas, patio, shrubs and plants. To the rear is a yard area and outhouse. Communal access to all houses runs along the front. Tenure - Freehold, unregistered title but title plan on a 1949 conveyance in the deeds; please see legal pack for more information. Note - Plans shown are for information only and are not to scale.